Every two weeks, the blogosphere comes alive with something called a Blog Off. A Blog Off is an event where bloggers of every stripe weigh in on the same topic on the same day. The topic for this round of the Blog Off is "What's the best advice you've ever received?" The best advice I've ever received came from Stephen Sondheim. Actually, Sondheim didn't deliver it personally. Rather, someone suggested that I pick up a copy of Sondheim's 1984 triumph, Sunday in the Park with George. 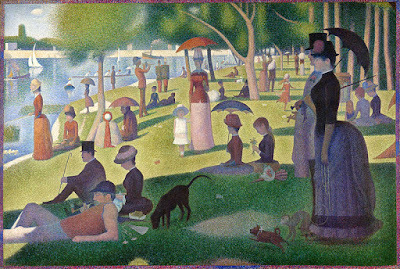 Sunday in the Park with George, like all of Sondheim's work, is deep and complicated. If you're looking for something light and uplifting, a Sondheim musical probably isn't for you. Sunday in the Park tells a fictionalized story of Georges Seurat, the French pointillist. Specifically, it tells a fictionalized story of his life as he set out to paint Sunday Afternoon on the Island of La Grande Jatte. Portions of the play take place within the painting itself. Act two moves the action ahead 100 years to the year 1984. Georges Seurat's great-grandson, George, is also an artist who shares the tortured soul of his famous ancestor. In act two comes the song "Move on." Here's a recording from a London Concert last year. The singers are Daniel Evans and Jenna Russel who starred in a revival of the play in London in 2005 and then again on Broadway in 2008. The best advice I've ever been given is in that song. Stop worrying where you're going, move on. Let me repeat that. Stop worrying where you're going, move on. When I first heard that song, I was a neurotic 31-year-old who spent more time second guessing himself than he did being productive or carving out some kind of happiness. I was unhappy and I couldn't figure out why. The first time I heard that lyric it hit me like a Mack truck that I wasn't happy because I wasn't letting myself be. I was so afraid to make the wrong move that I ended up not going anywhere. So I sat and wrote down all of the "bad" things in my life. I used to blame that stuff for my unease, but as I wrote I started to see that the common thread in all of those situations was me. Once I had that aha moment there was no going back. I'm hardly perfect and I backslide all the time, just like everybody else. But thanks to a song in a play most people have never heard of, I see my life differently than I did when I was that neurotic 31-year-old. I am a happy man and I got that way because I decided to be a happy man. I've never listened to any of the songs from Sunday in the Park - what a joy! Especially to hear dialogue in a musical spoken in an English accent. I think the same sentiment in Move On is heard in this number: http://www.youtube.com/watch?v=LZwm3kJfCk4 excellent blog-off Paul! Wow, I feel so... umm... simple around so many of my colleagues! While they're going to the opera or the museum in a town we're visiting, I'm out photographing back streets. I greatly admire your (and their) erudition, but will never get there myself. But thanks for this post, Paul: it highlights the fact that insights are highly dependent on where you're sitting (or standing) at the time. Don't feel bad, Steve- While you're out photographing and Paul is watching the opera, I'm catching the latest episode of Toddlers and Tiaras. Hey, they could use the "move on" advice, too! Amazing post, Paul. What I love about it is that I feel as if I just learned to know you on a deeper level. Your voice in your writing has really opened up since I've been reading your blog. As I was reading this today I felt as if you were drawing me in, inviting me to sit with you while you told me a story. I love the intimate tone you achieved here and the music was a bonus! Thank you for poking around the attics and basements and finding all this really cool stuff. I think a lot of time people are not moving on because they are anchored by the stuff of their past that keeps growing and weighing them down... the inbox of mail, the to do list that never gets smaller, the house that always needs something repaired, the car.... you get my point. Every now and again, we need to just gather up the crap and clean out to the bare walls, the bottom of the dustbin and go forward from there. Very tough to do.. I struggle with is all the time. Thanks for the reminder that happiness, is a choice. I don't always make the right one. Wonderful, thoughtful and insightful post. My challenge isn't to be happy, it is to remain happy in spite of everything life throws my way. "Move on" may become my mantra during these interesting times! Paul -- you know this hits home for me . . . you know, and I do find it funny that a lot of the offerings this week struck on the "self" -- I of course love this advice and do way too frequently bad slide... if I could only focus myself enough to just stay . . . fixed . . . on the idea of me that has *little* control (in the grand scheme) over what happens. anyway . . . maybe I'm reading too much. but good post.